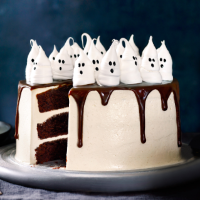 For the ultimate Halloween centrepiece try Edd Kimber’s nutty butterscotch cake, topped off with these spooky ghosts. 1. Preheat the oven to 180°C, gas mark 4. Spread out the sugar on a baking tray and bake for 20 minutes, until warm and light golden. 2. Meanwhile, using electric beaters, whisk the egg whites in a clean bowl, until frothy. Whisk in the warm sugar, a spoonful at a time, beating well between each addition. Add the cream of tartar and whisk for 4-5 minutes more, until the mixture is cool and the sugar has mostly dissolved. a piping bag fitted with a 1cm nozzle and pipe ghosts, about 2cm wide and 4-5cm tall, onto a parchment-lined baking sheet. Bake for 1 hour, then switch off the oven and leave to cool with the door ajar. Decorate with the gel colouring and arrange on top of the nutty butterscotch cake. This recipe was first published in Mon Oct 26 11:23:00 GMT 2015.